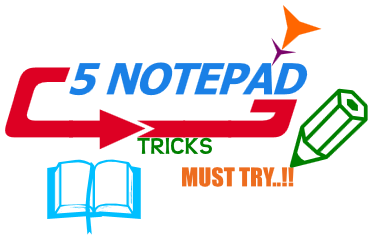 Notepad is a best text editor for windows os ,but it is not the only thing for which notepad is famous.it's also famous for many kind of funny tricks.Okay now from this post i am going to show you how can you make some funny tricks and hacks with notepad.Watch below ..!! :- Now save it with type slowly(Or any name) and with .vbs extension. Second trick to Create a funny virus :Eject CD/DVD continuously. :- Now Save it as Antivirus test.exe or .exe extension . Important note:-Make sure the file type is kept as ALL FILES while saving it as a .bat file.